Black out is back! 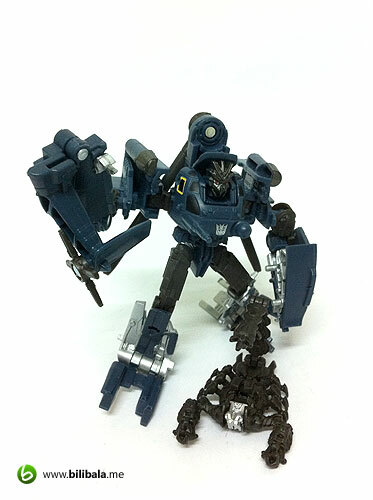 Well, definitely not in the movie at least but in a much more smaller scale Transformers toys – the Dark of the Moon Cyberverse Commander class. For those who have watched the 1st Transformers movie (way back in 2007) should have known him better. 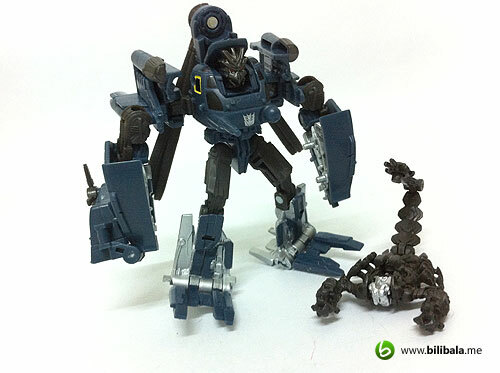 And if you are following my blog, you know that i have previously done a review of him but in Transformer Animated version (you can read here). Anyhow, let’s move on for what this small movie version of Blackout can offer you! Read on! 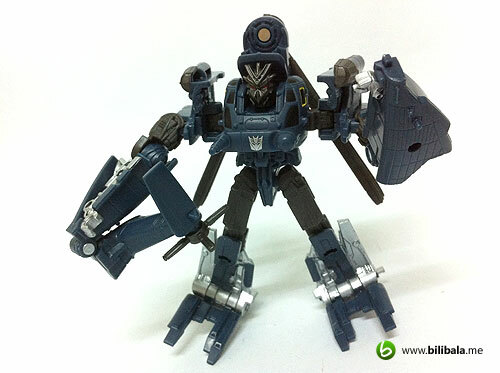 If you remembered, there’s a movie version of Blackout toy which has been released in Voyager class back in 2007 (try searching google for related pictures). 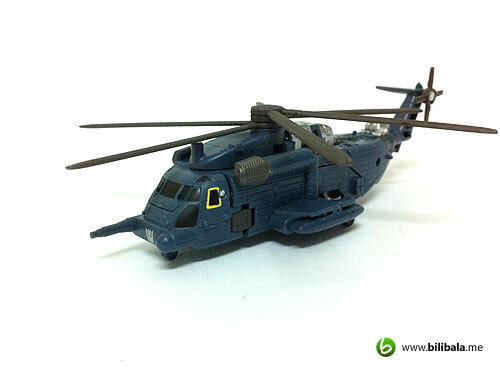 Of course, being a voyager class, that is a much more bigger version. However, don’t let this smaller scale of Blackout fooled you, for what he got to offer you is very much on par with other classes, apart from the size differences that is. 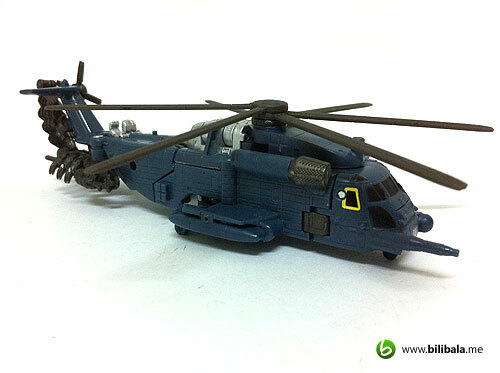 The original alternate mode in the movie is actually a US long ranged combat search and rescue (CSAR) helicopter. Okay, instead of search and rescue, this wicked Decepticon bears non of the intended purposes but instead to search and destroy. 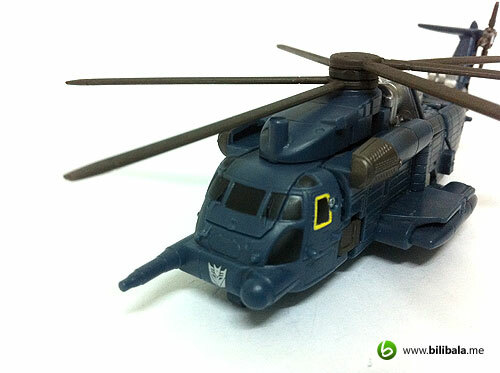 Anyhow, this is the 1st ever helicopter (and none after that) Transformer in the movie trilogy. Despite being small, the amount of details this alternate mode has is abundant. 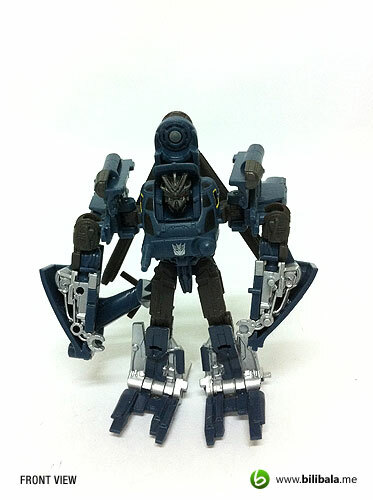 The overall color is of navy blue, which takes up 90% of the whole alternate mode. By the way, they are not paints but merely the plastic colors. However, you can notice quite some parts of it being painted in metallic silver color which does add in the details. 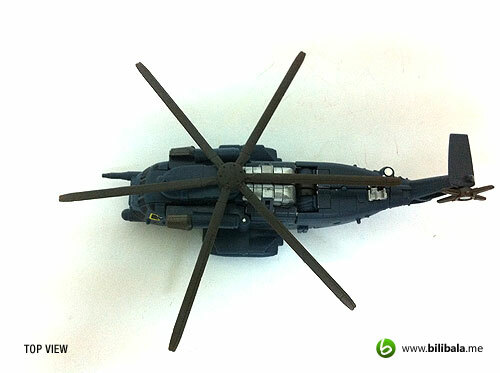 There are the 6 blades rotor which is flexibly rotatable. 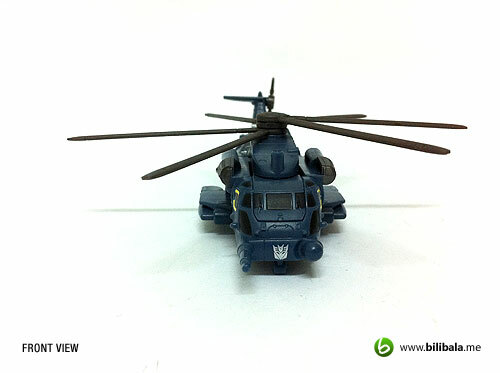 The Decepticon insignia is clearly imprinted on the bow of the helicopter. 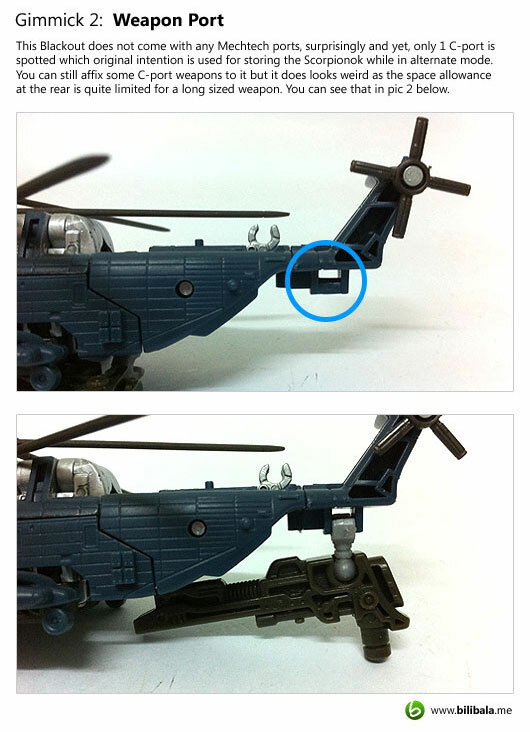 There are the 2 areas of metallic silver color: One being the engines located just below the top rotor and the one located at the rear rotor (which are actually the hands of the robot mode). 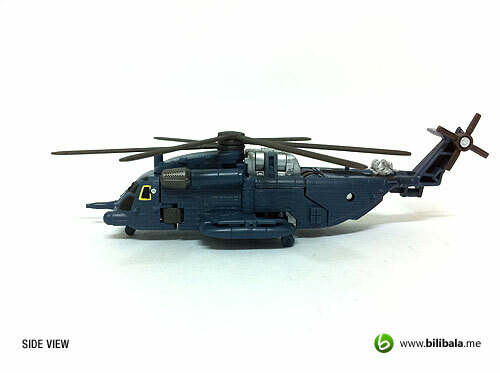 With simple and involving twist and turn, here you go with Blackout in robot mode. Notice the hands and legs are painted in metallic silver color. 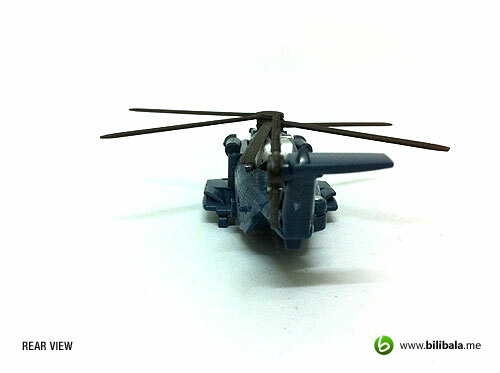 The overall plastic build for this toy is quite solid imho and you don’t really feel those cheaply built plastic around. 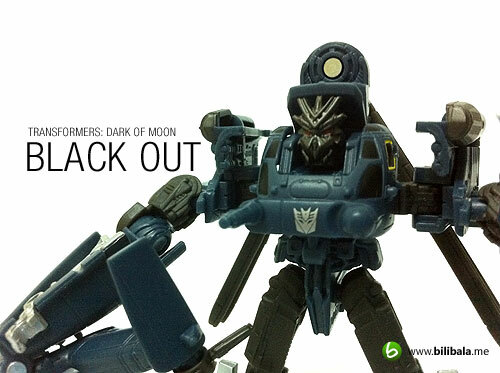 And what’s more, despite the size of being small, this Blackout is packed with loads of articulation which definitely better than some of bigger Deluxes or Voyagers. There’s a point which i really dislike is the size and shape of the leg which is a bit too squarish large imho and this make it quite difficult to stand in proper posture. Moreover, i got a loosen ball joint for one of the hips and this makes it even more hard for him to stand properly as it tends to slide sideways as it is performing a leg split action. The overall body to weight distribution is quite okay. 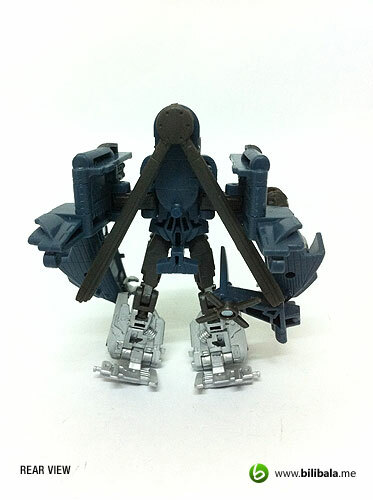 Despite you see the upper body is taking up the weight of the whole robot at side view (especially with the wide and lengthy shoulders), the back is actually hollow which does reduce the weight of its back. However, due to the large squarish base of his leg (AND the loosen ball hip joints), posing with him might need some efforts. Oh ya, there are no waist and neck joints. From the back, you can notice the hollow area which i mentioned and it is actually used for storing those folded rotor blades in place. It does look like a robot with huge arms and legs but with a small body from the rear perspective. 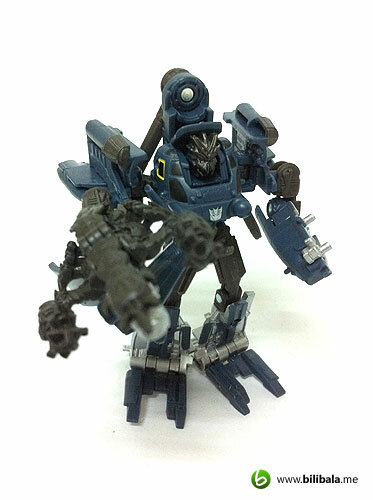 Being a Cyberverse Commander class, transformation is expectedly simple but yet quite involving. It still requires some twist and turn during transformation as compared to the smaller legion class and the transformation process can go as complicated as those scout class as well. 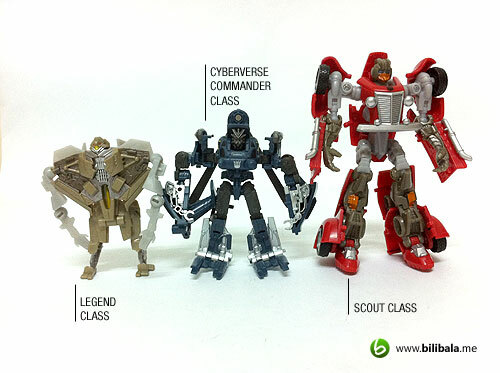 You might be wondering how this new Commander class size as compared to others “smaller” scaled Transformers toys. 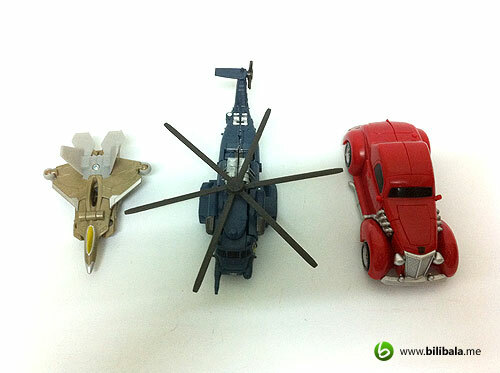 I have made a simple comparison in both robot and alternate mode here. As what you can see, the size of the new Commander class is right in the middle of a Scout class and slightly bigger than legend class (which is the smallest of all). Price wise, the commander class actually is being sold as the same price as the bigger Scout class which DOES justify the purpose of being “cost-reducing” by having smaller scale toy. 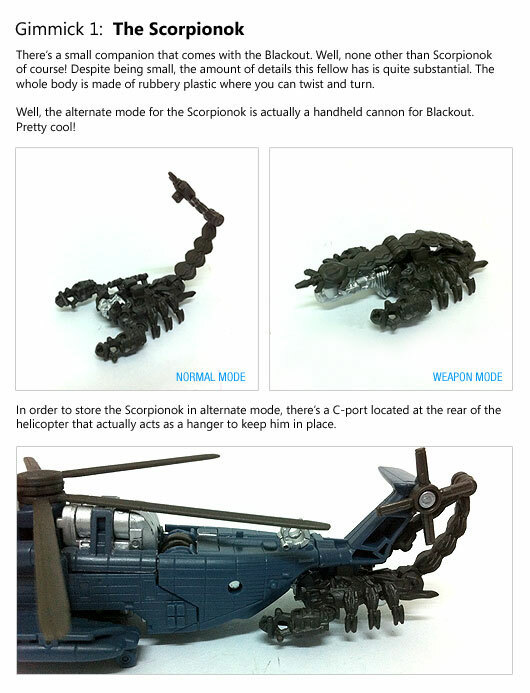 Maybe the extra bucks are being distributed to the “extras” you have with the toys such as the extra articulations, colors and other gimmicks (like for Blackout, the Scorpionok that is). Despite being smaller in robot mode, the scale of it in alternate mode is not quite obvious or similar sizes as the Scout class. 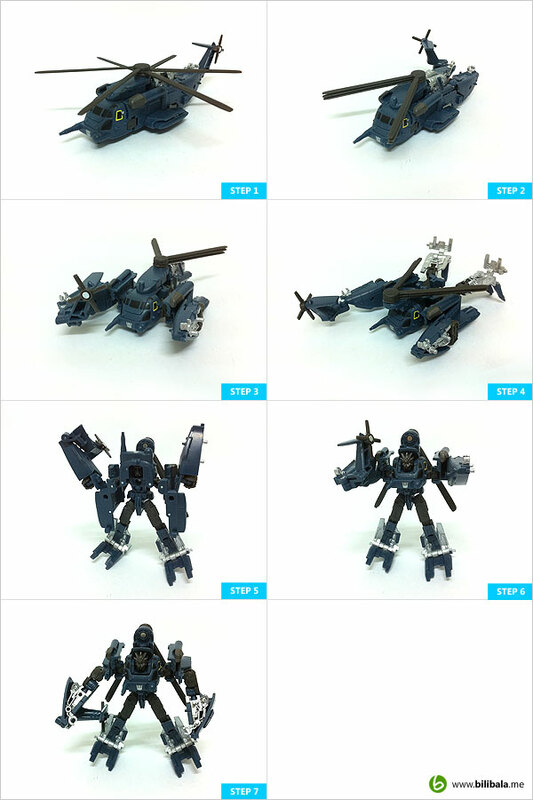 Well, here are some more pictures taken from different angles for both alternate and robot mode. Enjoy! 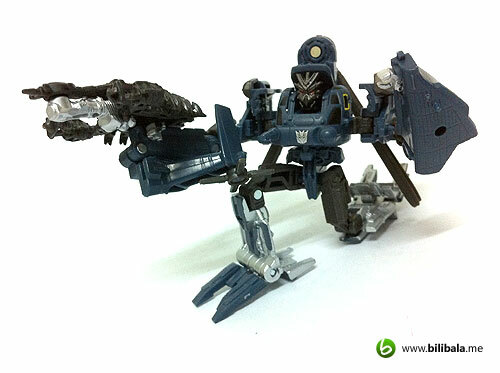 Shot of Blackout with it’s cute and small companion, the Scorpionok, which also is the handheld cannon for him! Well, despite the small and a bit pricey tag for this collection, me myself think is worth the buck. With the extra cool Scorpionok and nice silver metallic color, these are justifiable for such worth. 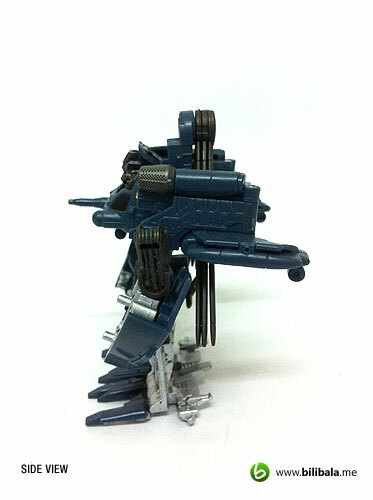 The loosen hip joints might not be in every Blackout and i guess it is much of QC problem in certain units which can be fixed easily by applying a layer of nail polishes around the joint to make it more tighter. Anyhow, my PCR (Personal Collection Rating) for him is 8.5/10. 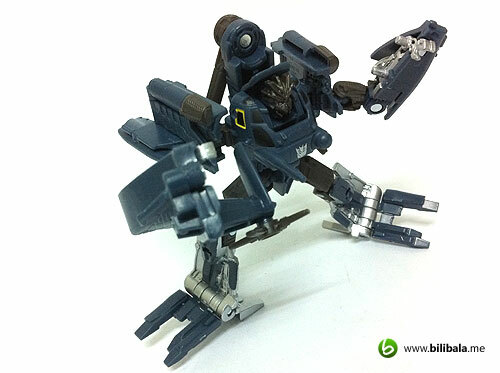 If you don’t mind the size and the squarish block feet, it is worth the buck and collection! Until then, happy hunting and hauling! no wonder. hahaha.. i guess i will "revisit" Transformer 1 & 2 movie again. 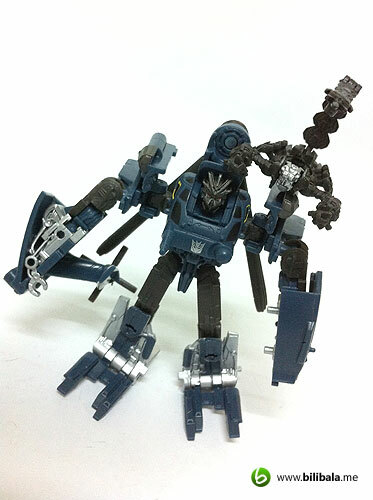 Sorry bro, been busy with DOTM toys review nowadays (as you know is DOTM fever now :p) I guess the Bruticus along with other toy lines have to slide. Wow... bro, i didn't really notice that bro. Thanks for pointing out! 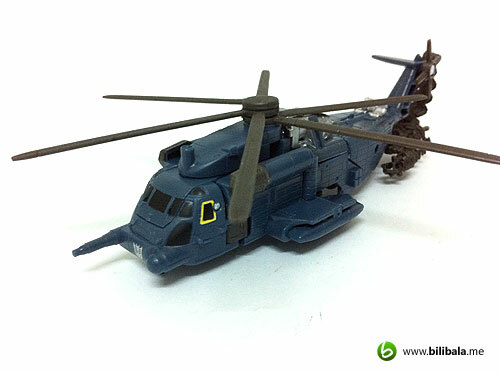 Wow, quite detailed for this little fellow, and I like the Scorponok/blaster combination :) By the way bro, there's a helicopter in movie 2, I believe he's called Grindor. He can be seen in: a) Alt mode: when he kidnapped Sam and Mikaela in a car while they were running away from Alice. 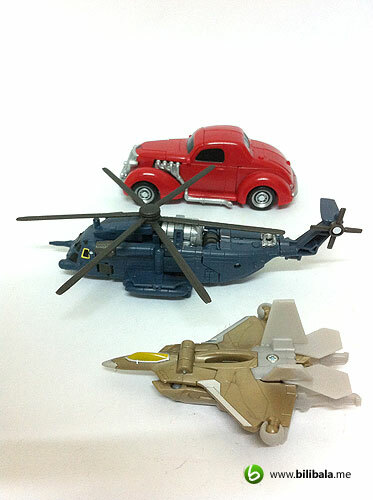 b) Robot mode: fighting OP with Starscream and Megatron in a forest/park.